The Husband and I are big opera buffs. For many years we have gone to performances at both the Metropolitan Opera and the New York City Opera on a regular basis. As a recent present, the Husband got me a really fancy, powerful pair of opera glasses, to enhance my operatic experiences. This weekend, we went to see an opera. It was great having these glasses. I could see everything on stage, even though our seats were in the back! I loved it! Well, until I realized that there are downsides to seeing everything that happens on stage, up-close and in great detail. One of the elderly male singers accidentally let his pants slip during an aria, revealing tight black thong underwear! This holiday is one of my favorite things about living in the United States. We'll be hosting the Sister and an assortment of friends. In fact, our tiny little apartment will be bursting at the seams with good company and delicious food. This year, in the midst of this recession, I have so much to be thankful for - my health, my wonderful family and my relatively stable job. May we all have a wonderful Thanksgiving, and take the time to appreciate all of the blessings we have. One of my coworkers just used the word "grody" to describe something she found disgusting. I hadn't heard that word in about 20 years! At least since the mid-1980s. "That [fill in Michael Jackson song] was bitchin'!" I hate when I leave work feeling all gassy, and I don't know why. Or whether it's something I ate. And then I go to my martial arts class, where I'm supposed to be all focused and meditative and contemplative. And then through the entire class, all I can think is, "Gosh! I really need to try not to fart!!" It really makes exercising so stressful. Every jumping jack, every pushup, brings me uncomfortably close to the fine line between getting through class and committing a grievous offense against my classmates. It defeats the purpose of exercise, which is to relax. It's always nice to breathe a sigh of relief after a long and anxious class. At a recent networking event, an elderly female attorney came up to me and asked, "So are you a law student?" "No," I replied. "I'm a practicing attorney." It must be that pearl cream that I use, along with all other Asian women, to maintain that youthful glow. So my firm just announced that the H1N1 (swine) flu vaccine will be available to all employees soon. I am in favor of the vaccine, and will get myself innoculated if the opportunity arises. 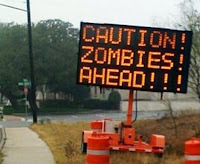 But I can't help but wonder...could this just be the first step toward the inevitable zombie apocalypse? Isn't that how everyone turned into zombies in I Am Legend? A scientist came up with a "cure" for cancer, and then the next thing you know, everyone who got that shot turned into FLESH EATING ZOMBIES!! Well, if that happens to me, I'll be in the company of my coworkers. So my day-to-day life really won't be that different from the way it is now..